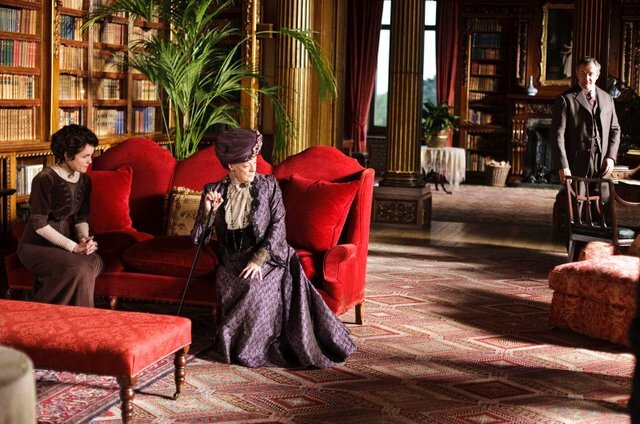 The whole point about Downton Abbey -I mean, Highclere Castle – is that the present Lord and Lady Grantham – I mean, Earl and Countess Carnarvon – still live there. Most of the houses we see are not lived in any more. They have been bequeathed to the National Trust by people too weary of trying to haul a stately home through the twentieth century. 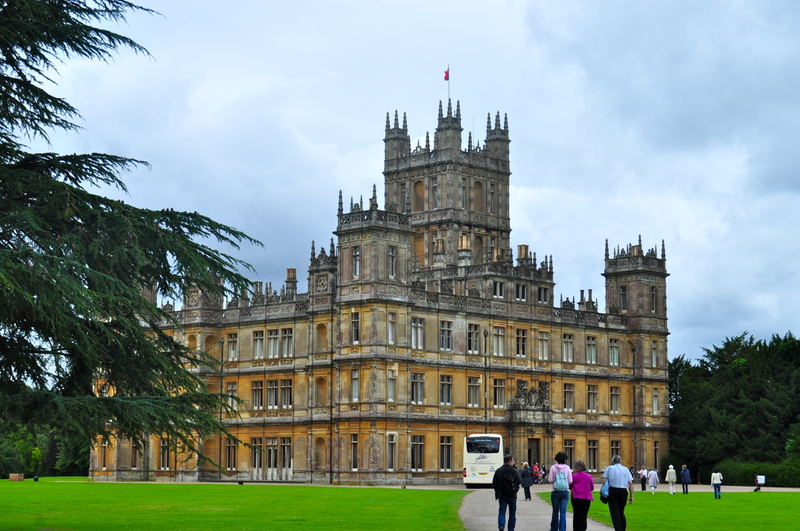 Highclere – alias Downton – is one of those lucky castles which has learnt to make its own way in the world. Thus, when the TV cameras are cleared away following the final filming of the 2012 Christmas special, after this weekend, and when the hoi polloi have stopped tramping over all the carpets and sitting in the armchairs: the Carnarvon family moves back in. It shows: because despite its Jacobethan grandeur, the place is jolly comfy. And perhaps that is why scouts for the ITV series, which has become an international runaway success, chose Highclere for the Granthams to inhabit. There are pictures of the Carnarvon family everywhere. Pictures from centuries ago, pictures from just last year. Small Carnarvon children in welly boots clowning with Daddy; an Elizabethan portrait of ancestors Lord and Lady Kingsmill,. pictures of the family’s racing wins at Ascot. All mixed, because life is all one. History is a long, straggling, absorbing line. 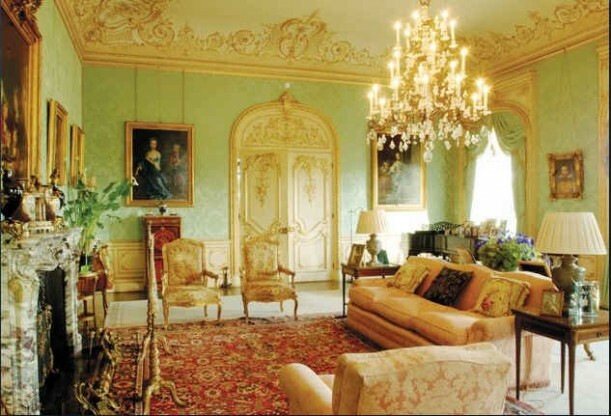 Highclere, then, has the same trappings as any great house, though maybe a tad more taste. Walk through that great dark door at which you have seen Lady Mary wait for Matthew Crawley, into the gothic entrance hall designed by the man who fashioned St Pancras Station; and you will be ushered into the library, a high two-part long room , walled with more than 5,000 books, some dating back to the 16th century. Drama dogs real life families too. 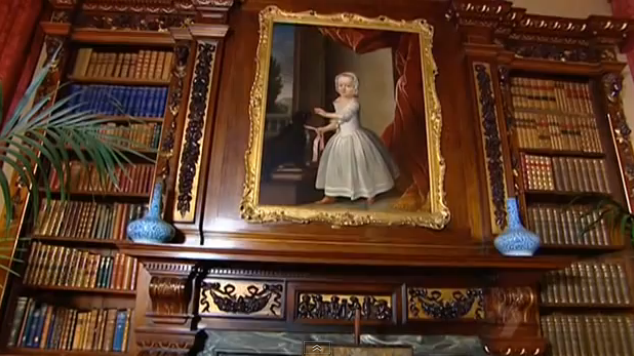 Above the fireplace is a portrait of a pretty little girl, who it seems was not a pretty girl but a very important little boy. Sir Jon Acland, portrayed in a nice white frock was painted in 1749 by Thomas Hudson. But he went on to cheat death in the American Wars of independence: only to return home to be shot in a duel in the grounds of the castle. And remember the first world war hospital which was set up at Downton? Lady Almina, illegitimate daughter of Albert De Rothschild, made the most excellent marriage to the fifth earl of Carnarvon. She was the lady who had the consummate taste to decorate the south facing drawing room. She chose the prettiest shade of eggshell blue. and it is still as pretty today. It was Almina who made the decision to turn Highclere into a hospital and receive wounded men returning from the trenches. Through the state rooms and up a staircase we gazed down on the saloon: the heart of the castle. A sitting room with a roof as high as the castle itself, surrounded by balconies leading to bedrooms and other nooks and crannies. It has the air of a theatre: for one could stand on a balcony and eavesdrop on a conversation down there as though it were a stage. It is the setting for so many of Downton’s most dramatic scenes. But it has seen its own share of drama; what must the scene have been when news of the fifth earl’s death was broken, just six weeks after he had opened the tomb of Tutankhamun? And up in those balconies one can only imagine the whispers which might have been; we passed Lady Grantham’s bedroom, a gorgeous light room full of grace; and paused to grin at the room which was used as the lodgings of the Ottoman attache, Kemal Pamuk, who dies in such very unfortunate circumstances in the television drama. It’s a stage, this place: but also a family home, with centuries of history and snaps on every available surface. The Carnarvon family has achieved a rare balance here at this flamboyant place where the line between fact and fiction is so very hazy, and where truth can turn out to be even stranger than the inventions of that fictional, compelling Abbey. Posted in Places to visit, Quirks of HistoryTagged Downton Abbey, Highclere Castle, period dramas, TV dramasBookmark the permalink. Nope: they are dynasties who know how to show off a house, for sure…. Quite. And ITV. Hard to talk about a place without any visual prompts at all…Carnarvon. You remember the tale about the little dog who was said to drop dead at Highclere, the very moment his master died thousands of miles away? The stuff of novels and ITV dramas, indeed. 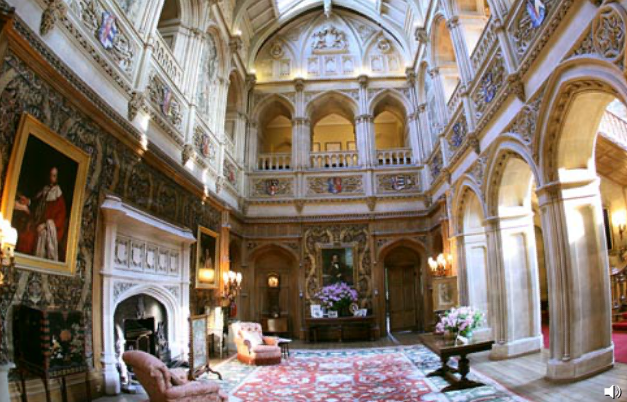 I loved the interior of Highclere and in particular that central hallway. Imagine being a small child and having those wonderful balcony areas to hide behind and spy on the people below. I know. The vision of that central saloon! And to see how it was used in days past, almost like some kind of auditorium! Gorgeous pics and such fun weaving the real and imagined stories together. It was. Hard to keep a grip, sometimes, Lou, because the two are so close together there. I’ve always wanted to see Highclere. Thanks Kate for taking us there! Hi, Cheryl 🙂 You are most welcome! Thank you, Kate, for taking us into Highclere Castle with its nooks and crannies, its drama and life. Of course, you know I am utterly and unapologetically jealous and will think of you watching Downton Abbey’s next season with an intimate knowledge of what it is like inside. Gorgeous. I still have trouble wrapping my head around the fact that people still *live* in these places. I have no idea how one would expand to fit a place like that. Though, if your folks ahae been living there for centuries I suppose it must be a habit. Of all the tours you’ve taken us on, Kate, I think you’ve loved this one most. I could sit in that heavenly sunlit space with the balconies for the rest of my life. I enjoyed it immensely, Andra: it was a nice home with the requisite amount of drama to make it interesting. A place filled with stories, a backdrop designed by Barry. What more could one want? Can you imagine having all those old books at your disposal, Linda? Wonderful. Dear Kate, as an avowed fan of the television series “Downton Abbey,” I found your posting today a delight! Besides all the background on the family that lives there, the photographs are captivating. One question: Will there be another season here in the United States? Or is there only going to be a Christmas special? Peace. There will be a special at Christmas, and a season three with- wait for it – Shirley Maclaine as Lady Grantham’s mother. How will we wait through the days until that arrives?? On the Highclere Castle web site, they even have a section for weddings and events. Maybe when Phil hits 50 you can have his milestone b-day party there. Great idea, LameAdventures. He can dress up like Matthew Crawley. I should enjoy that immensely. If I ever win the lottery, though, it’s an international bloggers knees-up at the Ashmolean. You heard it here first. I have just morphed into spokesperson for the entire US faction of your following: we’ll be there! Makes me wish I had watched some of the TV series now! Never too late to start, Pseu 🙂 It’s not heavyweight.. I do hope they entertain Maggie Smith and her dry wit. She has all the best lines and so obviously enjoys the role! I caught the Christmas show on the Net…must have been 2011?? Surely I didn’t run across a sneak preview of 2012! Anyway, I snooped through the site and found photos of the owners. They seemed so “approachable” – I cannot imagine giving up such a grand home for a tv crews and chaos. Thanks for this very interesting peek. I am sure ITV will have made the whole enterprise worth its while, Amy. Highclere was like any other stately home on its uppers until Downton changed it into an international phenomenon overnight. And now the fields surrounding it are filled with huge coaches arriving on tour…a happy partnership, I’d call it. It is affable stuff, Tom. Phil plays ‘spot the historical inaccuracy but he hangs on every word. If it were a book it would be a page turner. How nice of you to fill us in on the reality of this gorgeous place (It does photograph well). I agree with one above – oh, the library! So glad the place is managing to survive in good condition. Sigh, such nice places to walk. Hi, Phil 🙂 Thanks for coming to take a look today! Can you imagine Celi’s farm here? All that rain…everyone would be so content. Though I love her farm just where it is. The library is stunning. My fingers itched to take down and read, like Jane Eyre’s once did at Thornfield. Yes: the place is surrounded with the most gorgeous places to walk! Lovely share, Kate . . . Downton Abbey is such a fascinating look back at the way things were done “in the day.” BFF and I have enjoyed the series immensely. I, as much as I thought I would. He, far more than in his wildest dreams. Great writing, well drawn characters, and a BRILLIANT setting. It is such a dramatic setting Nancy: which, against all the odds, they have made into a home. A fitting backdrop for the ITV drama. Enjoy series 3! It really is lovely. I didn’t know there was a series. Is that Maggie Smith on the red sofa? What a quaint and heartwarming tale. Loved it. This has to be on my ‘must-see’ list on the next visit. And blow the cost! Following a link from the link you gave, I was fascinated by the true stories of the actual family. Apparantly the writers weren’t basing the story on the Carnarvons, but there are, as they say, ‘uncanny’ resemblances. There are. In fact I would go as far as to say the Carnarvons beat the Granthams hollow on the dramatic stuff, Col.
How fascinating. Poor Sir Jon Acland – what a cruel twist of fate. I am a ‘Downton Abbey’ addict. Watched the whole of the first series in one go on a flight on my iPad. And thoroughly enjoyed the behind-the-scenes documentary screened on TV here a few weeks ago. Thanks for bringing us more fascinating insights, Kate. Pleasure, BB. I think I would like to go back again: there was so much to see and so little time to take it in. I loveeeee watching downtown abbey ! So good to see all these pictures Kate ! Hope you make it one day, Ritika 🙂 Thanks for commenting. Highclere sounds like a fascinating place and how exciting it must have been to be a child there! Next time I see it on TV (I am an avid follower of the series), I will be thinking of your post! Thank you for a great tour around the castle. Pleasure, Barb 🙂 It was indeed fascinating. I need to go away, bury myself in the history books, and then return, I think! Great post Kate! I just love Downton Abbey! I can’t imagine living so large though. Be fun I think for a week, but as a lifestyle and for generations?